Multiple painful lipomas. Courtesy of Waikato District Health Board and DermNet New Zealand (http://www.dermnetnz.org/assets/Uploads/dermal-infiltrative/w/dercum-1.jpg). The onset of Dercum disease (adiposis dolorosa) is insidious, but it has been described in at least one patient as having occurred after puerperal weight gain. The pain is out of proportion to the physical findings and is often described by patients as "painful fat.” The pain increases with increases in fatty tissue and in connection with menstruation. Estrogen replacement at menopause has not been shown to reduce the pain. Dercum disease (adiposis dolorosa) has been classified by the World Health Organization (WHO) as a distinct entity. The National Organization of Rare Diseases (NORD) notes, "Dercum Disease is a rare disorder in which there are fatty deposits which apply pressure to the nerves, resulting in weakness and pain. Various areas of the body may swell for no apparent reason. The swelling may disappear without treatment, leaving hardened tissue or pendulous skin folds." The understanding of the pathogenesis and mechanism of Dercum disease (adiposis dolorosa) remains unknown. The origin of the pain is obscure, and the disease is better known as a clinical entity rather than as a physiologic or metabolic process. Fatty deposits are thought to cause nerve compression and result in weakness and pain. A review of the histopathologic findings of Dercum disease (adiposis dolorosa) showed no consistent histologic abnormality in the adipose tissue that might distinguish these tumors from common sporadic lipomas. In theory, the sudden appearance of the disease together with the incidence of a slight increase in the number of inflammatory cells in the fat could point toward the disease being, in part, an immune defense reaction. [11, 15] Some authors believe that the sympathetic nervous system may play a role in the origin and development of the pain. Gamez et al described an unusual syndrome characterized by maternally inherited multiple symmetrical lipomatosis in a pedigree harboring the 8344 mutation in the tRNAlys gene of mitochondrial DNA. Although the probands in their study harbored this mutation and had sensory polyneuropathy, they lacked the typical neuromuscular manifestations of MERRF. Recently, an abnormal lymphatic phenotype was discovered in three patients with the disease compared with four female controls using near-infrared fluorescence (NIRF) lymphatic imaging. The lymphatics in the participants with Dercum disease (adiposis dolorosa) were intact and dilated but could not readily clear lymph when compared with lymphatics in four control patients. Further NIRF imaging revealed masses of fluorescent tissue within the painful nodules, suggesting a lymphovascular etiology. The cause of this poorly understood disorder is unknown, although multiple candidate theories have been proposed, including endocrine dysfunction, mechanical pressure, and inflammation, among others. No theory has been consistently substantiated. Dercum disease (adiposis dolorosa) is rare and the prevalence has not been established. Dercum disease (adiposis dolorosa) is 20 times more common in females who are postmenopausal, obese, or overweight than in other people. It can occur in individuals who are not obese. Sixteen percent are males. Dercum disease (adiposis dolorosa) is most commonly seen in persons aged 45-60 years. It may occur in women younger than 45 years. A survey of patients with the disease concluded that 85% of patients developed symptoms before the onset of menopause. Adiposis dolorosa is almost never seen in children. The course is of Dercum disease (adiposis dolorosa) chronic and progressive. Educating patients about the chronicity of Dercum disease (adiposis dolorosa) and the available limited treatment modalities is important. Proper education about the aggravating and relieving factors should be explained. Patient education about Dercum disease (adiposis dolorosa) is crucial. Addressing any possible needs of those persons with disabilities is important, preferably with the assistance of an occupational therapist and a social worker. Various aids may be needed in the home and at work. The Dercum Group was formed in 1990 in Lund, Sweden. The group, which is a part of the Association for Rheumatics, is nationwide and has approximately 300 members. It works to provide support and information to both individual members and other interested parties. Dercum FX. Three cases of a hitherto unclassified affection resembling in its grosser aspects obesity, but associated with special symptoms: adiposis dolorosa. Am J Med Sci. 1892. 104:521-35. Schaffer PR, Hale CS, Meehan SA, Shupack JL, Ramachandran S. Adiposis dolorosa. Dermatol Online J. 2014 Dec 16. 20(12):[Medline]. Herbst KL, Asare-Bediako S. Adiposis Dolorosa is More than Painful Fat. Endocrinologist. 2007 Nov/Dec. 76(6):326-34. Palmer ED. Dercum's disease: adiposis dolorosa. Am Fam Physician. 1981 Nov. 24(5):155-7. [Medline]. Hansson E, Svensson H, Brorson H. Depression in Dercum's disease and in obesity: a case control study. BMC Psychiatry. 2012 Jul 3. 12:74. [Medline]. [Full Text]. Roux J, Vitaut M. Maladie de Dercum (Adiposis dolorosa). Revue Neurol (Paris). 1901. 9:881-88. Stern H. Adiposis dolorosa with myxoedematous manifestations. Am J Med Sci. 1910. 139:359-63. Hansson E, Svensson H, Brorson H. Review of Dercum's disease and proposal of diagnostic criteria, diagnostic methods, classification and management. Orphanet J Rare Dis. 2012 Apr 30. 7:23. [Medline]. [Full Text]. Greenbaum SS, Varga J. Corticosteroid-induced juxta-articular adiposis dolorosa. Arch Dermatol. 1991 Feb. 127(2):231-3. [Medline]. Skagen K, Petersen P, Kastrup J, Norgaard T. The regulation of subcutaneous blood flow in patient with Dercum's disease. Acta Derm Venereol. 1986. 66(4):337-9. [Medline]. Lynch HT, Harlan WL. Hereditary Factors in Adiposis Dolorosa (Dercum's Disease). Am J Hum Genet. 1963 Jun. 15(2):184-90. [Medline]. Cantu JM, Ruiz-Barquin E, Jimenez M, Castillo L, Macotela-Ruiz E. Autosomal dominant inheritance in adiposis dolorosa (Dercum's disease). Humangenetik. 1973 Mar 23. 18(1):89-91. [Medline]. Campen R, Mankin H, Louis DN, Hirano M, Maccollin M. Familial occurrence of adiposis dolorosa. J Am Acad Dermatol. 2001 Jan. 44(1):132-6. [Medline]. Leites SM, Davtian NK, Emanuel' VIa. [Pathophysiological characteristics of adipose tissue in Dercum's syndrome]. Patol Fiziol Eksp Ter. 1972 Jan-Feb. 16(1):47-51. [Medline]. Blomstrand R, Juhlin L, Nordenstam H, Ohlsson R, Werner B, Engstrom J. Adiposis dolorosa associated with defects of lipid metabolism. Acta Derm Venereol. 1971. 51(4):243-50. [Medline]. Gamez J, Playan A, Andreu AL, et al. Familial multiple symmetric lipomatosis associated with the A8344G mutation of mitochondrial DNA. Neurology. 1998 Jul. 51(1):258-60. [Medline]. Silvestri G, Ciafaloni E, Santorelli FM, et al. Clinical features associated with the A-->G transition at nucleotide 8344 of mtDNA ("MERRF mutation"). Neurology. 1993 Jun. 43(6):1200-6. [Medline]. Rasmussen JC, Herbst KL, Aldrich MB, Darne CD, Tan IC, Zhu B, et al. An abnormal lymphatic phenotype is associated with subcutaneous adipose tissue deposits in Dercum's disease. Obesity (Silver Spring). 2014 Oct. 22(10):2186-92. [Medline]. [Full Text]. Stallworth JM, Hennigar GR, Jonsson HT Jr, Rodriguez O. The chronically swollen painful extremity. A detailed study for possible etiological factors. JAMA. 1974 Jun 24. 228(13):1656-9. [Medline]. Giudiceandrea V. L’adiposis dolorosa (malattia di Dercum). Riv Patol Nerv Ment. 1900. V:289-304. Haddad D, Athmani B, Costa A, Cartier S. [Dercum's disease: a severe complication in a rare disease. A case report]. Ann Chir Plast Esthet. 2005 Jun. 50(3):247-50. [Medline]. Amine B, Leguilchard F, Benhamou CL. Dercum's disease (adiposis dolorosa): a new case-report. Joint Bone Spine. 2004 Mar. 71(2):147-9. [Medline]. Freedberg IM, Eisen AZ, Wolff K et al, eds. Neoplasms of subcutaneous fat. Dermatology in General Medicine. 5th ed. New York, NY: McGraw-Hill; 1999. Vol 1: 1348-9. Bhandari R. Resident rounds: Part III. Calciphylaxis in the setting of non-hemodialysis, rapid weight loss, and mixed hyperparathyroidism. J Drugs Dermatol. 2014 Feb. 13(2):208-9. [Medline]. Fagher B, Monti M, Nilsson-Ehle P, Akesson B. Fat-cell heat production, adipose tissue fatty acids, lipoprotein lipase activity and plasma lipoproteins in adiposis dolorosa. Clin Sci (Lond). 1991 Dec. 81(6):793-8. [Medline]. Hansson E, Manjer J, Svensson H, Åberg M, Fagher B, Ekman R, et al. Neuropeptide levels in Dercum's disease (adiposis dolorosa). Reumatismo. 2012 Jul 19. 64(3):134-41. [Medline]. Tins BJ, Matthews C, Haddaway M, Cassar-Pullicino VN, Lalam R, Singh J, et al. Adiposis dolorosa (Dercum's disease): MRI and ultrasound appearances. Clin Radiol. 2013 Oct. 68(10):1047-53. [Medline]. Petscavage-Thomas JM, Walker EA, Bernard SA, Bennett J. 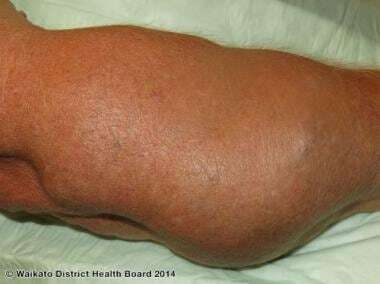 Imaging findings of adiposis dolorosa vs. massive localized lymphedema. Skeletal Radiol. 2015 Jun. 44 (6):839-47. [Medline]. Campen RB, Sang CN, Duncan LM. Case records of the Massachusetts General Hospital. Case 25-2006. A 41-year-old woman with painful subcutaneous nodules. N Engl J Med. 2006 Aug 17. 355(7):714-22. [Medline]. Martinenghi S, Caretto A, Losio C, Scavini M, Bosi E. Successful Treatment of Dercum's Disease by Transcutaneous Electrical Stimulation: A Case Report. Medicine (Baltimore). 2015 Jun. 94 (24):e950. [Medline]. Iwane T, Maruyama M, Matsuki M, Ito Y, Shimoji K. Management of intractable pain in adiposis dolorosa with intravenous administration of lidocaine. Anesth Analg. 1976 Mar-Apr. 55(2):257-9. [Medline]. Petersen P, Kastrup J. Dercum's disease (adiposis dolorosa). Treatment of the severe pain with intravenous lidocaine. Pain. 1987 Jan. 28(1):77-80. [Medline]. Steiner J, Schiltz K, Heidenreich F, Weissenborn K. [Lipomatosis dolorosa--a frequently overlooked disease picture]. Nervenarzt. 2002 Feb. 73(2):183-7. [Medline]. Singal A, Janiga JJ, Bossenbroek NM, Lim HW. Dercum's disease (adiposis dolorosa): a report of improvement with infliximab and methotrexate. J Eur Acad Dermatol Venereol. 2007 May. 21(5):717. [Medline]. Desai MJ, Siriki R, Wang D. Treatment of pain in Dercum's disease with Lidoderm (lidocaine 5% patch): a case report. Pain Med. 2008 Nov. 9(8):1224-6. [Medline]. Lange U, Oelzner P, Uhlemann C. Dercum's disease (Lipomatosis dolorosa): successful therapy with pregabalin and manual lymphatic drainage and a current overview. Rheumatol Int. 2008 Nov. 29(1):17-22. [Medline]. Herbst KL, Coviello AD, Chang A, Boyle DL. Lipomatosis-associated inflammation and excess collagen may contribute to lower relative resting energy expenditure in women with adiposis dolorosa. Int J Obes (Lond). 2009 Sep. 33(9):1031-8. [Medline]. [Full Text]. Hansson E, Svensson H, Brorson H. Liposuction may reduce pain in Dercum's disease (adiposis dolorosa). Pain Med. 2011 Jun. 12(6):942-52. [Medline]. Wollina U, Heinig B, Langner D, Nowak A. Juxta-articular adiposis dolorosa (Dercum's disease type IV): report of four cases and treatment by dermolipectomy. Wien Med Wochenschr. 2015 Sep. 165 (17-18):374-7. [Medline].